I was thinking about it yesterday, and I’ve had constant book contracts since 2002. That means constant book deadlines since 2002! This, friends, is the grace of God. It’s nothing I could have done without Him … I don’t even want to try! When I attended my first writer’s conference, I was 22 years old and pregnant with my third child. I had big dreams of being a “Christian author.” According to the world’s standards, there is no explanation for the fact that I have 50 books published and another 8 somewhere in the publishing process (from contract stage to soon-to-be released.) There is no explanation that some of one series is under contract in Hollywood either. I have no college degree. I work at home while I also homeschool. I have no parents or in-laws who live locally to fall back to for support. I have no full-time maid or nanny! What I do have is trust that God had a plan for me before I was born (Psalm 139). When I was considering if I should pursue writing, I thought back to my childhood. I grew up in a family who didn’t read many books, yet I found myself at the library constantly. That had to be God. Then, as a young mom, my close friend Cindy McCormick Coloma was also pursing writing, and God put her in my path to inspire and encourage me. He showed up again. At the very first local writer’s group that Cindy and I attended, we heard about the Mt. Hermon Writer’s Conference, and it was there that God connected me with numerous friends and mentors, including Robin Gunn. A few years later He brought Janet Grant into my life. She was just starting her agency, and she took a chance on me. What a miracle! But with all the ups and downs, a pivotal point in my writing journey happened during one of my publishing darkest moments. I’d been promised a book contract and then that fell through. I was heartbroken! Within days I went to a writing workshop by Ellen Gunderson Traylor. She spoke of a time when she had to relinquish her writing to God. She realized she’d been pursing writing more than she’d been pursing God. That night I went into my room and I did the same thing. I got on my knees and I told God. For a season it looked like that was happening. I cared for my grandpa during his last months of life, and I helped to start Hope Pregnancy Center. And through those experiences, I learned many things that changed me and transformed me. God rubbed my heart with sandpaper–showing me the pain and need of the world–and then He brought me back to writing. He showed me He did have a plan for my words, but He needed me to experience the world a bit more. He also had work to do in my own heart. Maybe your passion isn’t writing … or maybe it is … either way know that having a desire for someTHING should never loom bigger than God does. God planted talents and passions in your heart before your birth, but those things should never become more important than Him. 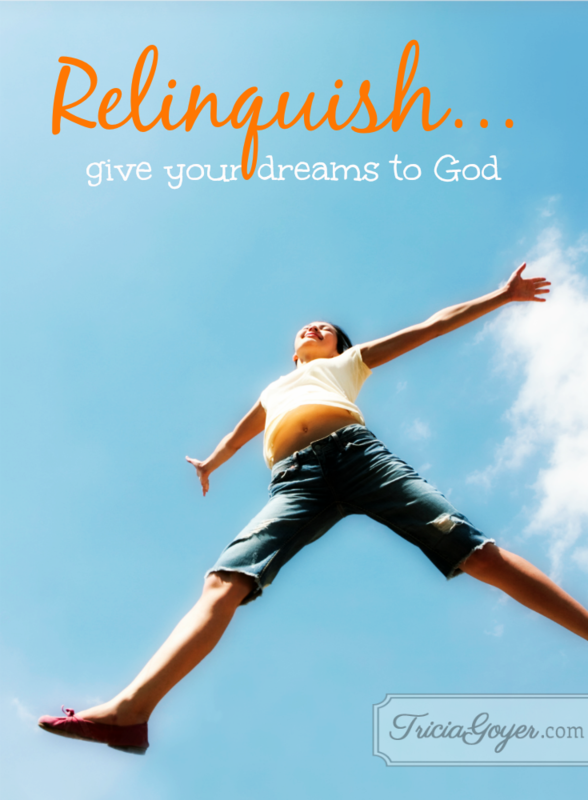 If you feel as if you’re hitting a wall, I encourage you to RELINQUISH those dreams. Tell God with a sincere heart that you want Him more than any thing. Turn your dream over to Him and let Him work. Sometimes it may seem as if He’s taking you completely off track, but God doesn’t see it that way. God knows what will prepare your heart for His good work. He knows what will bring you to the end of yourself so He can work. God doesn’t want to see what you can do. Instead, He wants to show you–and others–what He can do through you. No man or women can dream bigger than God can. I’m proof of that. And in the end, when our passions and talents are filtered through His purposes God gets the glory, not us. And we can step back, thankful to be part of His good work. What expectations or dreams do you need to relinquish to God and trust His perfect plan for you? P.S. Don’t forget to check out my Facebook page for a special WWII book giveaway! Thank you for this post, Tricia! It was just what I needed! The Lord is always so good to bring a timely word just when we need it. Blessings to you!